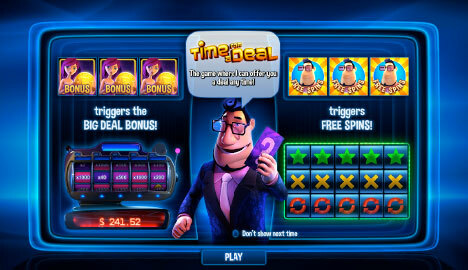 Fly Casino is please to present you a TV quiz show themed slot - Time for a Deal. Packed with incredible graphics, sounds and game play, this new 5-reel, 25-payline game at Fly Casino is packed with several bonus features and a great this progressive jackpot. The Big Deal bonus is activated when you get 3 Bonus Scatters on Reels 1, 3 and 5. The gameshow host will offer you 3 doors to choose. 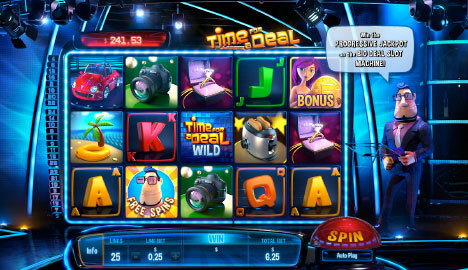 Find a gold coin to get 5 reels spinning of the Big Deal Slot Machine. Find a silver coin and you will spin 3 reels. 25 Free Spins Also up for Grabs! Free spins lovers will have a chance Scatters on Reels 2, 4 and 5, and you will activate a free spins round with up to 25 spins! Lots of fun and packed with so much more. Play it today. $35 X 5 Sunday! On Sunday from 00:00GMT until 23:59 GMT, all members on will receive a $/£/€35.00 bonus on your deposit of $/£/€30 or more. Claim 5X! 110% up to 110.00! From 00:00GMT until 23:59 GMT, all members on their deposit of $/£/€30 or more will receive a 110% bonus up to 110.00. Claim 2X! Value 150% TUESDAY! From 00:00GMT until 23:59 GMT, all members are invited to receive a 150% bonus up to $/£/€ 150.00 on your first deposit of $/£/€ 50 or more. Super Thursday! From 00:00GMT until 23:59 GMT, all members are invited to receive a 125% bonus up to 125.00 on your first deposit of $/£/€ 50 or more. Wager Requirements 35X (Bonus + Deposit).